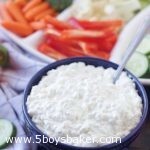 This Ranch Cottage Cheese Dip is absolutely delicious and so simple to make! It’s a delicious way to help get our kiddos to eat more veggies. A few weeks ago my friend walked into the gym looking like she was a 90-year old grandma. She got on the treadmill next to me and told me she hurt her back and could hardly walk. I tried not to laugh at her, but she was hunched over, walking at a 2.0 on the treadmill. . .I couldn’t help it. What made it even funnier is the way she hurt her back. She’ll probably kill me for telling you, but I’m going to. She was showing her son how to clean the toilet!!! She literally bent over to clean the toilet and her back went kaput! How could I not laugh at that, right? I laid in bed that night and thought about it and couldn’t stop giggling. My husband was like why are you laughing? So naturally I had to tell him and laughed the whole time. Well turns out Karma is real and yesterday my back went kaput and I’m now walking like a 90-year old grandma. To make it even more stupid, I was taking food photos! Yep, just slightly bending over taking some pics and I couldn’t get back up. . . .stupidest thing ever! 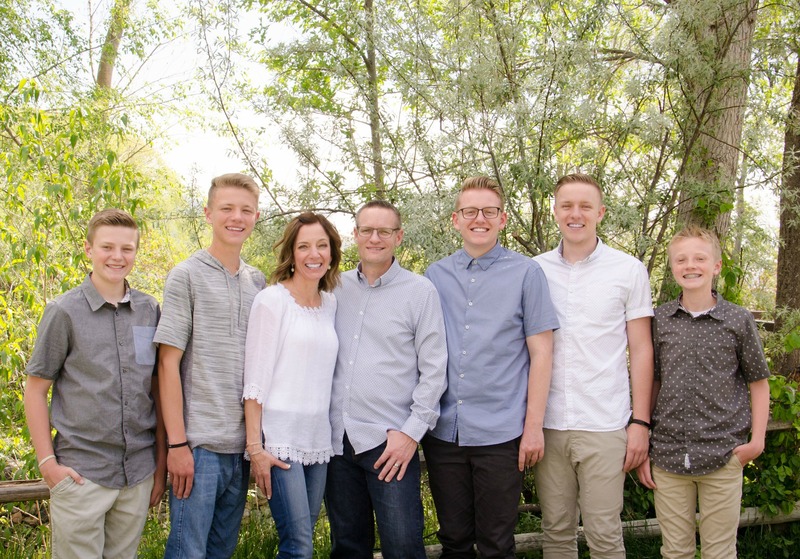 Anyway enough about bad backs and walking like a grandma. Are you one of those people that when the New Year rolls around you vow you’re going to eat better? Less sugar & treats and more veggies & protein? Yeah, well I always tell myself I’m going to be better, but being the complete sweets lover that I am, it usually lasts about half a day (lol!). 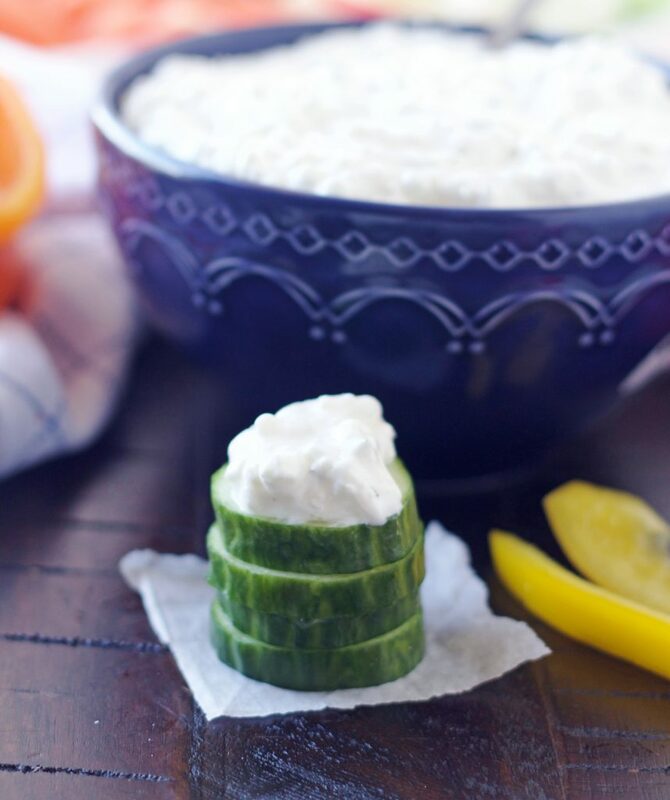 So for those of you who do commit to eating healthier, I’ve got a delicious dip for you today. I took this to a party the other night and everyone loved it! It’s the perfect accompaniment to fresh veggies and makes them taste even better. 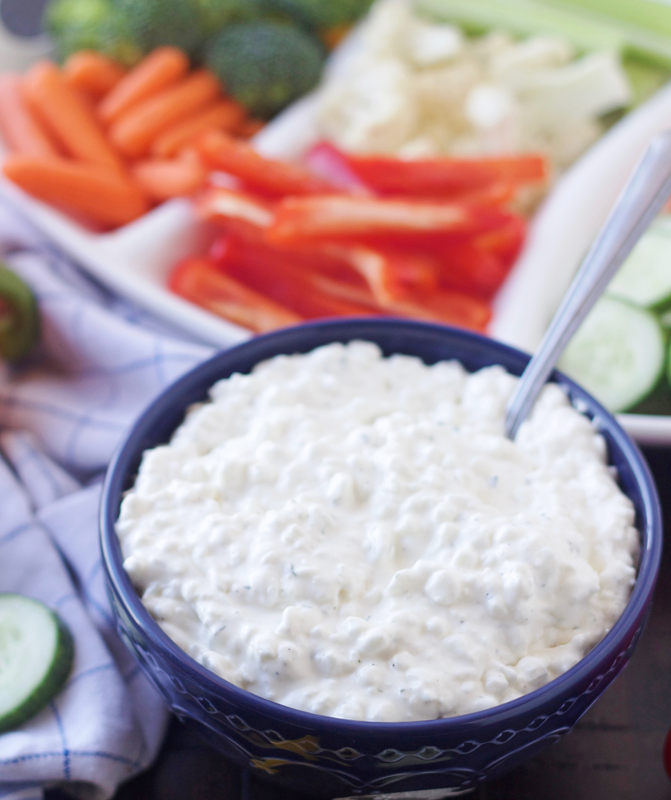 Not only does this dip taste good, but it’s got cottage cheese so it’s packed with protein. I think this would be so good on a baked potato! I’ve eaten this every day this week and am not about to stop. 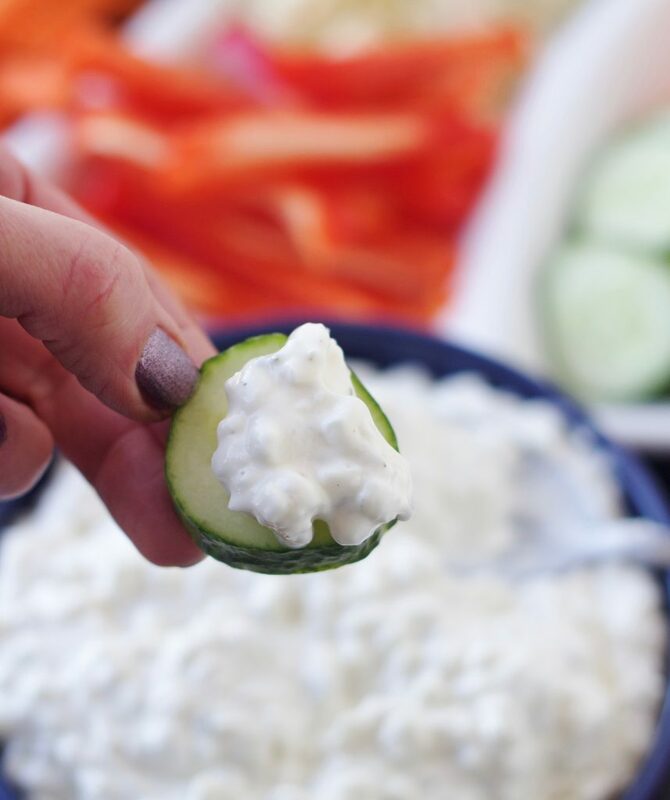 Although I’m sure there’s a point where the benefit of eating healthy, raw veggies is negated by the amount of dip you use. Oh and just because I’ve eaten this every day, doesn’t mean I still haven’t eaten plenty of treats. Oh well. . . . life is short! Serve with raw vegetables or crackers. Keep stored in the refrigerator.